Think Orange Juice is Healthy? Why You've Been Tricked! Think Orange Juice is Healthy? Why You've Been Tricked! Think Orange Juice is Healthy? Why You’ve Been Tricked! How many of you also think orange juice is one of the best sources of Vitamin C? If you answered yes to either of the above, then you’ve been conned by some very crafty marketing departments and businessmen – all in the name of making more money! In the past, Vitamin C became a huge buzz word. It was thought to be the cure for the common cold and flu (thought being the key word here). Some juice manufacturers picked up on this, and realising that oranges contain Vitamin C they saw a golden opportunity. As orange juice is so sweet and delicious, it wasn’t difficult to slap on a ‘Packed with Vitamin C’ label and sell it by the bucket load as a healthy drink. Does Vitamin C actually prevent cold and flu? How much Vitamin C is actually in a glass of orange juice? 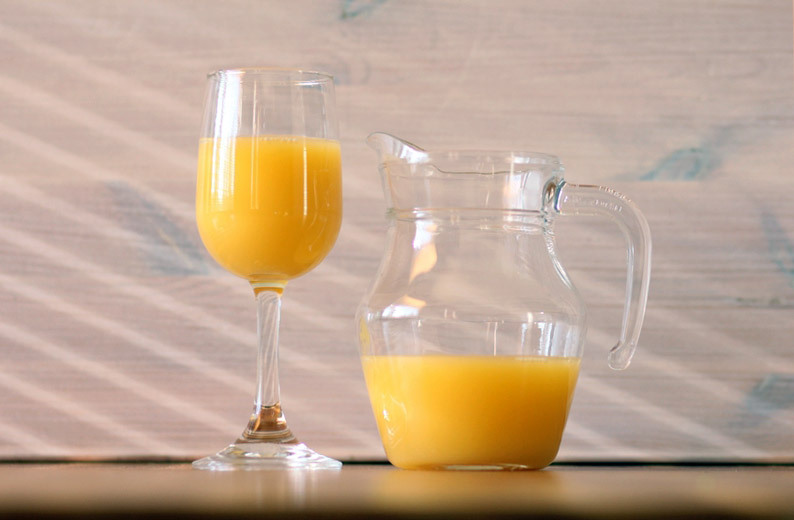 Are the ingredients in orange juice healthy beyond Vitamin C? As it turns out, Vitamin C hasn’t really been found to reduce the chances of getting a cold or the severity of the cold at all in the adult population, although it may reduce the duration a little. It was found to have some benefits for people living in extreme environments and those doing extreme exercise (such as marathon running), so Vitamin C could be a bit more relevant to us fitness junkies. However, it was mainly found to help people who weren’t eating a healthy diet in the first place – those who weren’t eating much veg, basically. On top of all of this, one cup of Tropicana orange juice only has about 75-90mg of Vitamin C in it anyway. On top of all of this, starting the day off with a glass of orange juice is basically starting off drinking a CUP OF SUGAR! Orange juice is 90% carbohydrates, almost all of it sugar. A typical glass of Tropicana contains 28g of sugar. This is MORE than the daily recommended amount of sugar suggested by the world healthy organisation – they suggest 25g per day! A big hit of sugar spikes your blood sugar and causes the release of the hormone insulin. Insulin signals to your body to use the sugar for energy rather than your fat stores – this brings fat burning to a halt. Your body will try and store the glucose (sugar) in your muscle cells as glycogen, but unless you’ve just been working out then your glycogen stores are likely to be full already, so then it will have to store it somewhere else. Your body will then try to store the excess in the liver, but this can only store a limited amount of glucose as glycogen. Any excess glucose will then be converted to fat and stored in your cells. If you keep spiking your blood sugar in this way, it can eventually lead to insulin resistance, where your body keeps producing insulin all the time and can’t use it effectively. Constantly having insulin in your blood means your body can never be in a fat burning state, and can lead to diabetes in the long run too. I think you can see why orange juice isn’t such a good ‘healthy’ drink any more, whatever the time of day! We stick to water and green tea, with the occasional coffee.